Ford campaigns at the Nassau County Veterans Coliseum in Hempstead, New York on October 31, 1976 during the final days of his reelection campaign. He was the only U.S. president never to have been elected president or vice president. Gerald Ford, who would have turned 100 this Sunday, is also remembered by the public as a leader who was neither the best nor worst—just very average. A 54% majority of the American public said Ford would go down as an “average” president in a Gallup poll last year, while about equal shares thought history will remember him as outstanding or above average (21%) and below average or poor (19%). These so-so assessments make Ford stand out in comparison with the seven other recent presidents evaluated in the same survey, each of whom attracted stronger feelings either pro or con. A 2011 Pew Research poll asked adults to name the person who had done the best job as president over their lifetime. 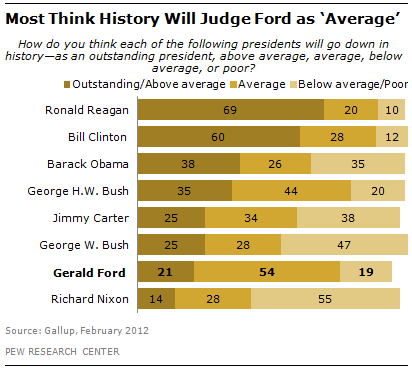 Less than 1 percent of adults named Ford, even when limited to those who were 18 or older during his presidency. No other president who had served since Herbert Hoover received fewer mentions (Bill Clinton and Ronald Reagan topped the list at 34% and 25%, respectively). Ford, a Republican from Michigan, was the minority leader of the House of Representatives when Nixon nominated (and Congress confirmed) him under the 25th Amendment to replace Spiro Agnew as vice president, after Agnew resigned in 1973. Nixon’s resignation during the Watergate scandal automatically made Ford the 38th president on Aug. 9, 1974. Declaring “Our long national nightmare is over,” Ford famously granted Nixon a full pardon for Watergate, a decision that was immediately controversial. By a margin of 58% to 33%, the public thought Ford had done the “wrong thing” in a survey by Time magazine immediately following the pardon. This view persisted through the election of 1976, which Ford lost to Democrat Jimmy Carter. 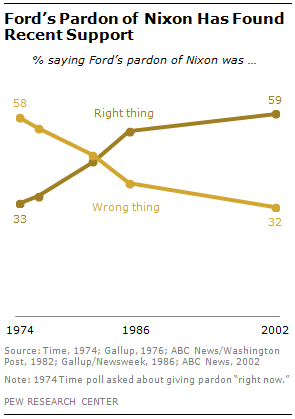 However, relatively few people said Ford’s pardon of Nixon was a key factor in determining their vote. According to a Gallup poll taken during the campaign, 22% said the pardon would be a “five” (the most important on a scale of one to five) in determining their vote, ranking it at the bottom among 20 issues tested. By comparison, 68% said the issue of inflation was a five. Over time, the American public came to largely support Ford’s decision. A 2002 ABC poll found that about six-in-ten adults (59%) saw the pardon as the “right thing,” while just 32% said it was wrong.